Have you ever watched a bird fly? Imagine being a bird, being able to fly. Just imagine the freedom and the carelessness. The feel of the wind through your hair, sending goosebumps up and down your spine. Birds are such beautiful creatures, their flying is their dancing. It takes true bravery to jump off that tree branch and to have total faith in your wings to help you fly safely and brilliantly. Leonardo da Vinci once said, “Once you have tasted flight, you will forever walk the earth with your eyes turned skyward, for there you have been, and there you will always long to return." One raining day on my walk home from school, I captured a photo of these two beautiful Rainbow Lorikeets. It was absolutely breathtaking. They say that Rainbow Lorikeets birds are always in pairs, always with the one they love. And I was able to capture that photo, even if it is just from my iPhone and not the best quality. Define Pluviophile. 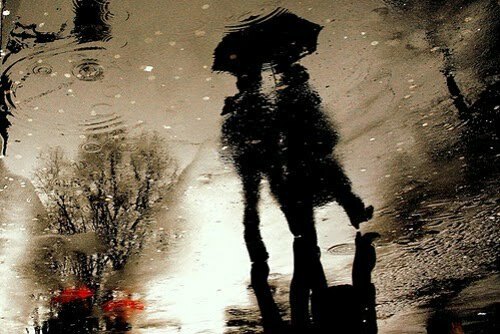 A lover of rain, someone who finds joy and peace of mind during raining days. One of my favourite quotes of all time is, "Life isn't about waiting for the storm to pass... it is about learning to dance in the rain." Vivian Greene. This quote like many others speaks out to me. It is about stepping outside of your comfort zone and enjoying the moment before it passes. One thing you'll find about me is that I love rainy days! Just looking out of my window to find droplets of rain hitting the ground little millions of fairies dancing. The smell is always so clean and fresh, giving me a warm feeling inside. The feel of it lingering against my bare skin, sending goosebumps up my legs. The puddles that form illuminate in the dark atmosphere. My love for it growing stronger every time it rains. Hello everybody! Today I have decided to be a bit courageous and post my first short story for my blog. I would love to hear what you guys think about it. I am going to be doing this a lot often on this blog, so feedback would be excellent! I will not bite you head off for giving your honest opinion, I will be actually grateful. Anyway, here is my short story. I hope you enjoy it! It’s hard loosing someone you thought you’d spend the rest of your life with. Especially when their illness was slowly killing them and all you could do was watch. I still remember the first time I met him. I was visiting my sister who had moved to Lepena a few years ago. She was hosting a lunch, and he just happened to be there. He was very close friends with her partner. I was scanning the room to try and find a familiar face when I saw his looking straight at me from across the room. I was mesmerised. His sea blue eyes standing out from his pale skin, and dark hair. He got up and walked towards me. There was something about his walk that caught me off guard; he had a slight limp. “Noah,” he had introduced himself, holding an outstretched hand. “Aaliyah,” I said, placing my hand in his. “Aaliyah,” he copied, as if testing the way it sounded. It was then I knew I was locked; I had fallen in love with this stranger. Noah had somehow convinced me to run away from my sister’s house with him. I didn’t know where he was going to take me; all I knew was that I wanted to be with him. I don’t know what would have happened that night if it wasn’t Noah; I was crazy to trust him. But I’m glad I did. He took me to Lepena Waterfall. It was absolutely beautiful. The clear water that fell from the top hit the river, pooling out. The mossy trees surrounding the mountain made it look like I was in a painting. I felt like I was in a painting. We spent the rest of the day there, and most of the night. We sat on the edge of the river dabbing our toes in the water and laughed. That’s one thing I loved most about Noah, we could just laugh at each other and nothing else mattered. Our silences were always comfortable; there was never an awkward moment. That waterfall had become a very big part of Noah and I. It was where he had proposed to me, and where our wedding was held. We married quite young, I was only 19. Noah had actually walked me down the long road, over the rocks to the only piece of grass where our ceremony was held. The arch was made of vines with large white roses, the green tress behind capturing the true complexion. My dress reached just above my feet, falling down my body like the waterfall across the river. My blonde hair flowed down freely, just how Noah liked it. Noah, who was standing across from me, truly was my prince. Every year since that magical day Noah and I went to the waterfall on our anniversary. It truly was our sanctuary. Noah was diagnosed with Soft Tissue Sarcoma two years after our marriage. He was slowly dying, but my Noah was a fighter. He grew very weak, and yet all I could do was sit back and watch. It was hard for him to continue visiting the waterfall every year, but he insisted. He told me that his love for me is where he got all of his strength to live on. And so he did, he lived on for as long as he could. And I never stopped loving him. From the moment he first said my name, to the moment he drew his last breath two days ago, to now as I stand before where I had him laid. At the waterfall. Every girl dreams of the perfect Sweet Sixteen, well almost every girl. I am not going to lie; I am one of those girls. My birthday is in December which means that my friend’s birthdays are before mine so they have already started thinking about their own Sweet Sixteen. This of course has made me start thinking. After long hours (not literally) spent thinking about it, I think I have finally come up the perfect Sweet Sixteen. So I have decided to help you come up with your perfect Sweet Sixteen. 1. First things first, you need a budget! Talk to your parents about how much you can really spend for this memorable night. It’s always good to remember that more money doesn’t necessarily make it more fun. 3. Location wise, you’ll have to find a popular place to have it that suits both the theme and the budget. 4. Invitations are an essential part, and must support your theme. Send your invites out at least a month before the party. 6. And lastly, enjoy yourself! What’s my Dream Sweet Sixteen? I am planning to have a Masquerade party mixed with a Night under the Stars! Like the traditional Masquerade Ball but personalising it to my own. I will be having masks and disguises; no one will know who anyone is. The party will not be at a venue, but in my backyard, under the summer night stars with outside surrounded by garden and fairy lights. I hope to have a DJ, dancing all night, a bonfire (I know, I know, a little odd for a masquerade but like I said, I am personalising it to my own) and a photo booth! So tell me, what’s your perfect Sweet Sixteen? I feel as though Life Goals are essential when it comes to success. Without them, how would you know what direction you are going to take or where you are headed? Coco Chanel once said, "If you were born without wings, do nothing to prevent them from growing." So I have decided to come up with a list of my own Life Goals and hopefully I am able to succeed most, if not all of them. I will keep you updates on any changes and achievements! The reason why I am blogging my goals to early is because, well everyone has to start somewhere. I don't have many of you fabulous followers, but I still want to let everyone aware of what I aim in life and if I strive to high of if I am successful and achieve them. It is also a great way to let you all know that goals really do work! I think that they work because if you have written them down, like set in stone, then you don't really want to let yourself down. Goals are a great way to keep you motivated in life and on the right track. So why don't you go make your own set of Life Goals? I love Thursday! It is my favourite day of the week. I don't really know how Thursday is different then any other days. I suppose it's because I always have the best luck on Thursday, it is my best day. I am always happiest on Thursdays! Why am I so happy? Well for one, it is Thursday. And because today I went out and put myself out there in search for a job, and I am quite confident. Something that would be helpful for you to know about me is that I have very low self esteem and little confidence in myself. Today is the third day that I have been job hunting. The first two times I handed my resume out I received very little results. The first time I got a call back and was asked for an interview, and then a job trial. However, I did not get the job. My mind started to tell me to just give up, that I had no hope on getting a job. What did I do? I ignored it! I kept pushing myself forward, always on the lookout for any open opportunities. So today I went around my local shops, places that I hadn't tried before, and I came home satisfied! I don't know why today was so different to the other days I tried, maybe because I was on the verge of giving up, or maybe just because it's Thursday. But whatever the reason, I pushed myself that little more further and became a little more happier. Now by results I don't mean 'yeah you got the job!' I mean promising responses that I will hear from them again, from more than one places also. What some people don't understand about my desire for a job is that it is not about the money. Honestly, I don't even think I need the money right now, I mean I'm only 15. I want a job for self satisfaction. It would be absolutely brilliant getting a call saying that I was able to sell myself with the little confidence I have, and that I have proved to someone that I am worthy for their time. To me, getting a job is getting me that one little step closer to achieving my life goals. Hey there, I would just like to take the time to formally introduce myself to you! My name is Chantel, and basically I am new to the world of blogging. The reason why I am taking up blogging is because, well simply because I love writing! This blog is going to have a little bit of everything I guess. Just whatever I feel like blogging, I will blog. A few things that I've got in mind is; reviews like beauty products, clothing, places even; weekly blogging; monthly reviews; and it sounds a bit lame, but I'm thinking even posting stories, just to see if you are interested. I want to become a writer because my goal is to change people's lives, inspire people and open their eyes with my words. I want to be thought as a genius who has a way with words and can just connect them together. When you are a writer you are anonymous. Sure your name is written on your work, but your face is hidden. When people read your work, they don't think about how you look, how big you thighs are, or how badly you can sing. The only thing that is going through their minds when they read your work is how brilliant you truly are. It's like they are giving you the chance to prove to them how unique and beautiful you are without needing to see your face. I really do not know what is going to happen from here, but I am really excited to see. I do hope that I achieve something out of this, even if that means changing only one persons life I will be happy until the day I die. Please do not hesitate to ask me any questions, I am always open for a chat and advice. Don't be scared, I do not bite! Thank you so very much for taking the time to read my little introduction, and I hope we can continue this journey together.